First off, we should answer the question of why Mycroft is definitely not an intuitive. The two most commonly suggested intuitive types for Mycroft are INTP and INTJ, both of which, I’m not sorry to say, are impossible. Mycroft makes a lot of assumptions based on his own personal experience rather than relying on intuition to guide him in reading people. He’s very sentimental and hates Sherlock’s unconventionality. That said, he’s most certainly not an Ni dom, but rather, carries a strong Si as one of his top two functions. 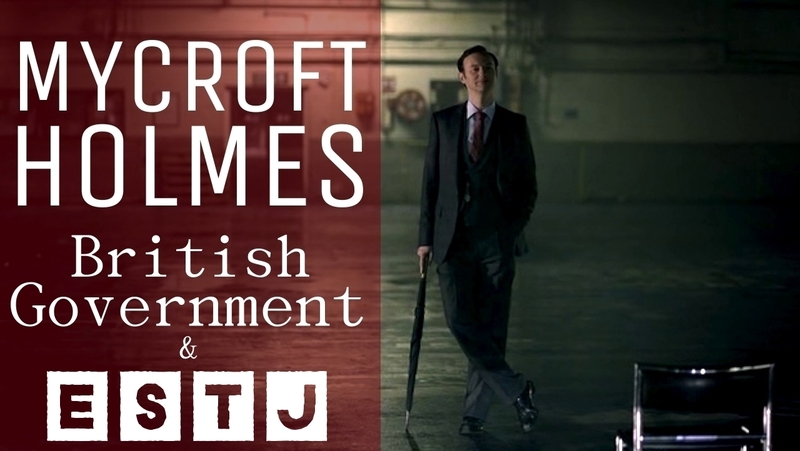 Do we really think Mycroft is a Ti dom? Honestly, he thrives off of being able to run and organise everything. He is the british government. Mycroft is rather controlling and wants everything to be in order and done his way –ergo, strong Te preference. That leaves us with ISTJ and ESTJ. Most people haven’t really even considered ESTJ as an option simply because they see Mycroft as being very antisocial. Yet, there are plenty of antisocial extraverts, just as there are social introverts. Funny enough, my parents show the polar ends of that spectrum (my mom is an antisocial extravert and my dad is a social introvert). However, to be quite fair, I finally decided on extravert for Mycroft as a result of analysing the order in which his functions work rather than going off of stereotypes. Loads of ESTJs in particular are mistaken for introverts simply because of where their values lie. My mom is an ESTJ who thinks she’s an introvert because she prefers to keep to herself, rather than hang out with lots of people all the time. However, the reason she prefers to keep to herself isn’t because she doesn’t get her energy from being with people (quite the contrary) but because she views herself as different and unable to relate to them (lower Fi). She’s very intelligent and runs the show just about as much as Mycroft does (her health pays for it though) which is what tells me she’s a Te dom. Now, it’s perfectly plausible for an ISTJ to think the same thing –and I would be surprised if none of them did (they’ve got lower Fi too). So, we’re going to contrast the difference between the two types just like we’ve done with Sherlock and Hamlet. The differences between these two are often subtle on the surface, but when you really dig down and think about it, they’re quite differentiable. TeSi focuses first on getting things done. It’s first priority is to organise, accomplish and achieve maximum efficiency (Te). The Si comes in as a concern for outward image, tradition and rules. However, this concern is not as strong in the ESTJ as in the ISTJ. 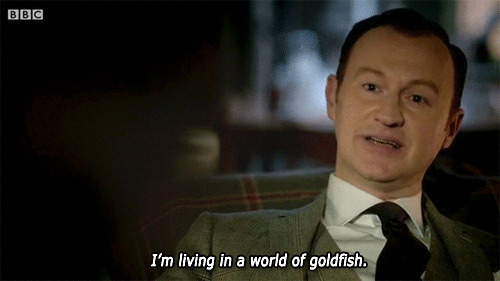 Mycroft tends to be rather controlling of his brother, and constantly checks in on him to make sure he’s not doing anything to foil his carefully-devised plans (Te). He wants everything done his way and doesn’t like anything to be outside his control. He manages the entire british government pretty much single-handedly (typical ESTJ stepping in and doing everything for everyone). His means of showing love for Sherlock is by doing things for him rather than expressing it in words. He spies on Sherlock to keep an eye on him, intervenes when he thinks his drug habit is acting up and is willing to threaten him to keep him out of trouble. This often comes across as cold and Sherlock (who is an INTJ who hates being told what to do) resents this very much. I’d say that’s a clear Te dom. As for Mycroft’s Si function, he isn’t quite as concerned with rules and tradition as an Si dom would be –but enough to be an Si auxiliary. Mycroft is rather sentimental, but doesn’t necessarily like to acknowledge this due to the dominance of his Te function. Mycroft constantly refers back to the past and still views Sherlock as a child. He refers to him as little brother and when we see his viewpoint, Sherlock is frequently shown as a frightened little boy. In other words, he doesn’t feel as though much has changed and has a hard time fathoming the idea that Sherlock is a dynamic, constantly changing person, rather than a static constant. Is it just me, or was that whole “did you miss me?” shenanigan a ploy set up by Mycroft to get Sherlock out of a little jail time? Mycroft’s fine with saving Sherlock’s skin by helping him set up a fake death and then when he finally comes to collect him, the first thing he says is not, “I can’t believe how many rules I had to break to rescue you” (Si). No, he complains about how much work it was (Te). The ISTJ is most likely to asks what rule he’s breaking and whether it’s fair. Whereas the ESTJ asks how what she does will societally impact her reputation and plans. That’s the main difference between TeSi and SiTe, but we can elaborate more if need be. One thing that I’ve heard said and it’s sadly…true in many cases…is this. “You don’t have a relationship with an ESTJ, you have a contract.” Of course, this doesn’t really reflect accurately the ESTJ’s capacity to love, because ESTJs love just as deeply and intensely as any other type, but it does justice to what makes them mad. ESTJs (as Te doms) are primarily focused on getting things done. Their way of showing love is to do things for you and to organise their life around you. They expect you to do the same, because that is their love language. ISTJs (as Si doms) want everything to be predictable (as it was previously) and fair. They show love by giving everyone a precisely cut, equal slice of the brownie, and they expect you to do the same when you cut brownies. Hopefully that helps. I’ll be doing a general xSTJ type comparison later, but for now, I’ll leave it at this. “He is the British government” means most everything filters through him. He isn’t in charge of it. He “runs” it not in a “leadership” capacity, but in an “information clearinghouse” way that makes him indispensable to the people who are in charge of the different departments. If they want something done right, they ask him how or if it should be done or if there is a better way to do it. Mycroft is not a micromanager who feels he has to personally oversee (or “organize”) everything. Rather than spending his time ordering and controlling every aspect of a bureaucracy, he sees patterns and possibilities and comes up with ingenious answers to problems like the Bond Air solution. He is unconcerned with triviality, or control for its own sake. He is best typed as an INTP. I see you arguing against ESTJ, but I don’t see any evidence of INTP here. Have you written anything on the difference between Ni and Ne, and if so could you direct me to it? I don’t fully understand what “intuition” refers to as far as a cognitive function, much less how to determine whether it’s introverted or extraverted. I haven’t, but if you’d like to submit a question to the queue, please be my guest. I can’t guarantee a quick answer though. As you mentioned it at the end of this article that you’d be doing an xSTJ comparison later, would you mind doing it with ExTJs too? I would love to read that.